The Fiesta Cocktail Decoration Party Set is the ultimate way to adorn your cocktails, your drinks will be the highlight of the party with these must-have drinks essentials. With an accessory for every type of drink, you're bound to add a colourful, funky twist to any of your cocktails. 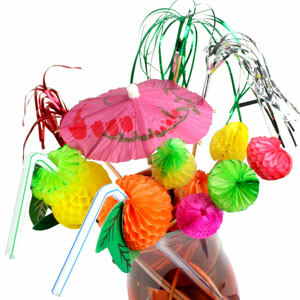 There's a decoration for every occasion and every cocktail; whether you're decorating a drink with the Paper Fruit Straws or adding some sparkle with the Palm Tree Sticks. Decorate your glasses with the exotic Umbrella Picks or Paper Fruit Picks, or simply add an elegant olive using the Cello Frill Cocktail Picks. "Everything we needed for our cocktail party"
"Purchased along with Luau Tiki PartyPack, these accessoories provide a great selection of decorations to finish t the cocktails. At a very reasonable price. What looks better tastes better"